More new things, this time for my shop on notonthehighstreet. I am expanding my range to cover some home items. These are my new lavender hangers, to make your home smell as good as these look. Also soon to be added are some cushion covers, a different type of lavender pillow for your drawers and a few more pretty things for you to adorn your house with. Hope you all like this new venture. 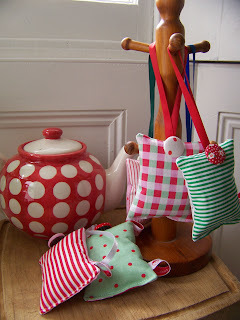 Love the fabrics you've used on these - very fresh and cheerful. Good luck with the new project! thanks so much ladies, glad you like them.